Jim Eccleston has received the highest possible distinction in the country- the Martindale-Hubbell 2016 AV Preeminent Award – Judicial Edition. This is the highest possible rating for both Legal Ability and Ethical Standards, reflecting the confidential opinion of the members of the Bar and Judiciary. 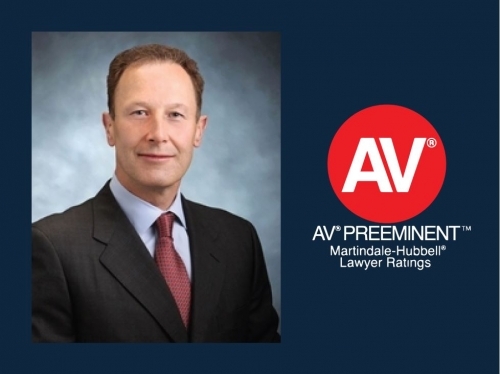 Martindale-Hubbell has been well known as the gold standard in attorney ratings for more than a century. This high standing award is a reflection of Jim’s professional excellence, expertise, and legal knowledge. This award is a true testament to Jim’s high ethical standards and professional legal ability and is only awarded to top lawyers who have achieved a 4.5-5.0 average rating in the areas of: Legal Knowledge, Analytical Capabilities, Judgment, Communication Ability and Legal Experience.